Obstructive Sleep Apnea Hypopnea Syndrome (OSAHS) patients suffer from a disturbed airflow to the lungs caused by partial or complete collapse of the upper airways during sleep. Therapy options are for example the wearing of a mask establishing continuous positive airway pressure (CPAP) or remodeling the pharyngeal geometry by advancing the mandibular either non-invasively by a dental device (Mandibular Advancement Appliance, MAA) or by a surgical intervention (Maxillomandibular Advancement Osteotomy, MMO). Numerical simulations on patient specific models based on CT or MR image data may be used to extract pathophysiological parameters like flow velocity and pressure distribution and can evaluate the severity of the disease as well as the success of a therapy. Numerical modeling can therefore function as diagnosis aid and base for patient-individual therapy planning. 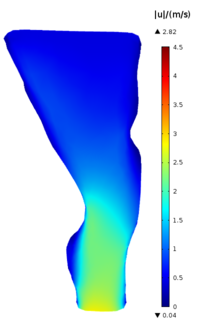 The numerical simulation of airflow is a part of the topic of Computational Fluid Dynamics (CFD) which describes the flow of any fluid by the Navier-Stokes Equations (NSE), which are a set of second-order quasi-linear partial differential equations that form conservation laws for mass and momentum of fluid elements. The solution of the NSE is a numerical challenging task especially in complex anatomical realistic geometries. 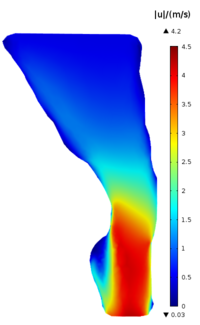 The research at our institute focuses on the usability of CFD simulations for an optimal therapy planning suited on the individual patient. Airflow velocity in a sagittal slice of a pharynx of a patient suffering from OSAHS without treatment (left) and the same patient wearing a dental device (right).